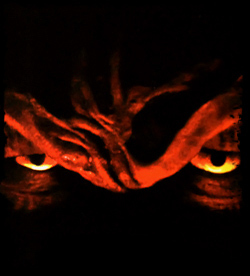 An ancient, evil spirit caught in the Nightmare on Elm Street story seeks to come out of films and into reality by haunting the cast and crew the of the original Nightmare in Wes Craven’s New Nightmare. New Line Home Video included this script on the original DVD release in 2000. It is available here in PDF format. 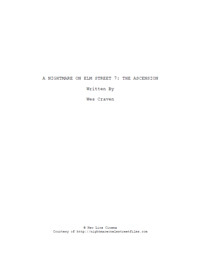 New Line Cinema, wanting to work with original Nightmare creator Wes Craven again, reached out to the director to resolve lingering animosities that had developed over the past ten years. “It began with [former New Line CEO] Robert “Bob” Shaye asking me to come into New Line because he had heard that I had some problems with the way the business side of A Nightmare on Elm Street had gone over the last ten years and that had been instrumental in me not wanting to participate, not just creatively but business-wise, with New Line,” Craven said. CLOSER ON BLADES — gleaming, dangerously long. CUTAWAYS TO FURNACES — belching FIRE and SMOKE. STEAM PIPES — hissing and dripping into endless depths of this hellish place. THE HAND — fitted with the final claw — now a super-modern, almost futuristic version of Freddy’s glove — flexing and trembling. THE MAKER’S RIGHT HAND — caresses it — then retracts and lays itself on the filthy work bench — the MAKER’S LEFT HAND ENTERS FRAME WITH A HUGE CLEAVER and raises it over the wrist of the right hand — then strikes down hard! Wes stops as his HOUSEKEEPER emerges from the kitchen with a steaming cup of coffee. Heather drinks immediately, despite the scalding heat. When the housekeeper disappears, Craven continues. I can tell you what the nightmares are about. They’re about this… entity. Whatever you want to call it. It’s old, very old, and it’s taken different forms in different times. The only thing that stays the same about it is what it lives for. Killing innocence, one way or the other. She notices the haunted eyes. The broken remains of her coffee pot. She looks back to her bedside table. The coffee pot is gone. The merest sound brings her head around, and she finds herself looking into a face not ten inches from her own, a dark, scarred figure, face contorted with menace, eyes catching the scant light just enough to glint incredible hatred and energy. Heather lets out the scream at the same second he strikes, lunging forward and driving her backwards over the bed, landing atop and pressing his ugly face right into hers. Now there’s enough of the moonlight to glimpse the pocked and crisped skull. XCU TWO SHOT and he drives down hard, but as he does, the bed suddenly twists up and over at the same instant, and the AFTERSHOCK HITS! Heather is thrown to the side at the last possible second. The blades slashing past her throat and hitting her up-thrust arm, a split second before she careens out of bed entirely. Hitting the floor hard, knocking herself out cold. As the quake’s last RUMBLES shake the room, then fall away. CLOSE ON HEATHER on the deck. Shaking herself back to consciousness. Looking around in shock. The room is normal. Only her bed seems affected, so askew half the mattress touches the floor.